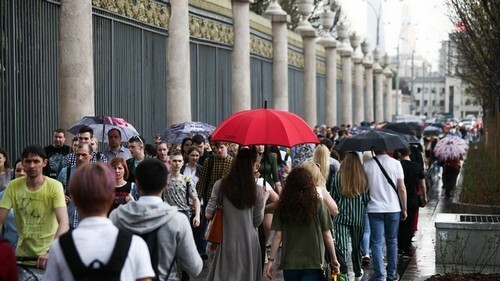 With Moscow suffering yet another cold and wet spell to start off the summer, Russia’s Meteorological Service has announced a new monitoring system to help visitors track the weather during the World Cup. “Our site will update the weather forecast for all host cities every hour,” the head of the weather agency Roman Vilfand said at a press conference on Friday, adding the information would be shared with the World Meteorological Organization (WMO). “That way, fans and teams will stay updated on the weather around the clock,” he said. The forecaster’s website now also has an English-language section, providing weather and air quality forecasts for all host cities. For Russia’s opening match against Saudi Arabia on Thursday, forecasters are expecting sunny weather with temperatures between 15 and 20 degrees Celsius. “It might be cold in the evening, so fans are advised to take a coat with them,” the state-funded TASS news agency cited an agency employee as advising. Whatever the weather, just remember that Moscow got a whopping six minutes of sunlight in December. So count your blessings.